Top Indian fashion and lifestyle blog: Kate Middleton meets First Lady of New York Chirlane McCray. 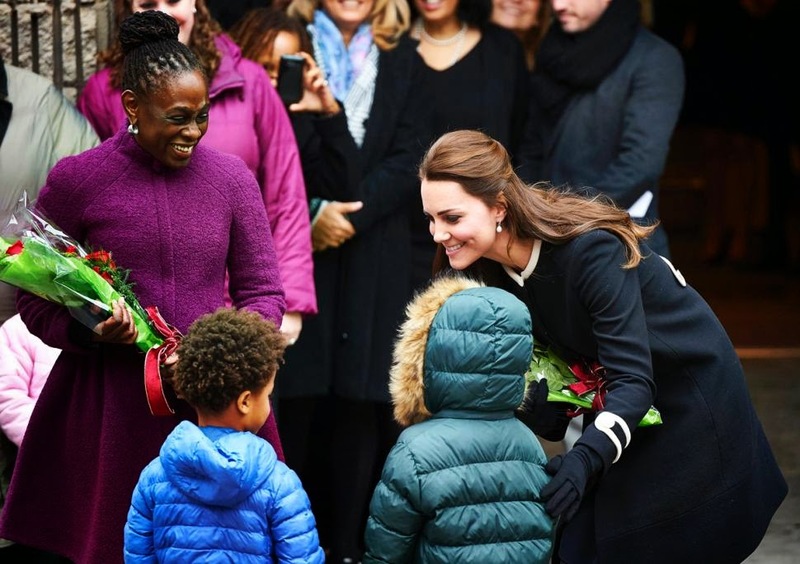 Kate Middleton meets First Lady of New York Chirlane McCray. The first lady of New York met Kate Middleton with a firm handshake and welcomed her to Northside Center for child development. The duchess met the children outside the Harlem center. Kate and her husband Prince William are on a 3 day official trip in US. Kate was wearing a black crepe “Washington” coat by Goat that had beige trim at the neckline, cuffs and back — and which sells for over $1,100. On to what Kate wore today. She was in the Washington coat from a label that has become a favorite for her, Goat Fashion. The coat is a swing style with a retro, 1960s feel. It is made of heavy wool crepe, with contrasting tabs at the cuff and on the back with decorative buttons. It is available at Goat in all sizes except 14, selling at £680, about $1050 at today’s exchange rates. It is also offered at Matches Fashion in all sizes, where it is priced at $1038. As many of us noticed, Kate’s coat is different than the version seen online and in stores, additional fabric was added to lengthen the garment. Fans made much of her footwear, towering black pumps that most five-month-pregnant women would eschew. 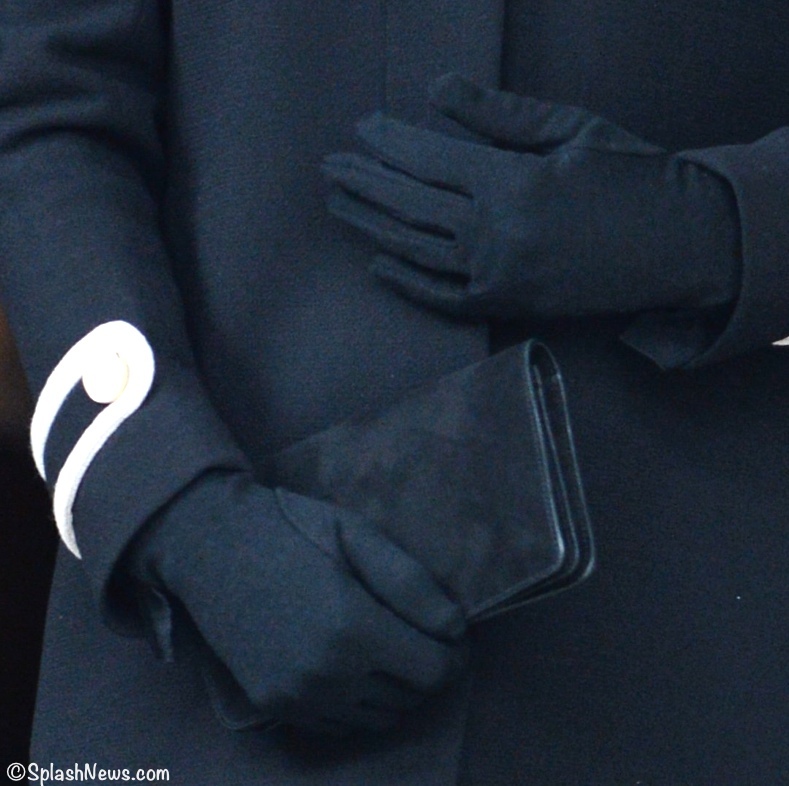 Kate carried her Mulberry Baywater clutch again, and had on her Cornelia James Imogen gloves. They are made of 100% merino wool, and have the side bow that Kate favors. The Duchess has worn the brand’s gloves for several years now. Each of these gloves was sewn in a converted cowshed on a farm in East Sussex, under the direction of the willowy Genevieve James. And while the company does make flashy lime-green-and-fuschia items for stage shows like “Mamma Mia,” many of its products are simply, subtly beautiful. It’s a mark of their class that all but the ski gloves, for example, have no external label or logo. An interesting note regarding not just the companies or designers whose pieces Kate is wearing, but the location where things have been manufactured: the Beulah dress seen Sunday and today’s Goat Fashion coat were made in Britain, just like the Cornelia James gloves. The Duchess isn’t just flying the flag for British designers, she is also promoting British manufacturing. Kate also wore her Annoushka Pearl Drop earrings suspended from Kiki McDonough hoops. For the day’s engagements the Duchess wore her hair partially pulled back.